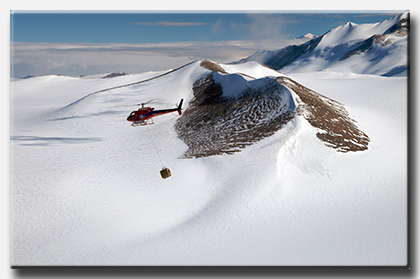 Petroleum Helicopters Inc. (PHI) of Lafayette, Louisiana, in 1996 won a competitively bid contract from the NSF to provide McMurdo-based helicopter operations as a part of the planned withdrawal of the U.S. Navy from Antarctica. The first austral summer season of operation was 1996-1997. The contractor provides four commercial helicopters — two AS-350-B2 "A-Stars" and two Bell 212s. The "A-Stars" carry up to 5 passengers and 1 pilot and have a flight range of 420 miles (676 kilometers). The Bell 212s have a greater capacity than the "A-Stars", carrying up to 13 passengers and 2 pilots. Their flight range is 237 miles (381 kilometers). PHI was again awarded the helicopter-support contract for USAP in 2013. 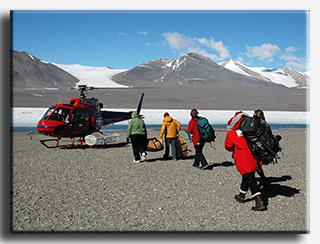 USAP participants board a National Science Foundation helicopter in Taylor Valley, McMurdo Dry Valleys, enroute to Blood Falls. NSF photo by Peter Rejcek.